A clock in the tower of the old Town Hall commemorates Queen Victoria. Victoria (24 May 1819 – 22 January 1901) was Queen of the United Kingdom of Great Britain and Ireland from 20 June 1837 until her death. From 1 May 1876, she had the additional title of Empress of India. Her reign of 63 years and seven months is known as the Victorian era. It was a period of industrial, cultural, political, scientific, and military change within the United Kingdom, and was marked by a great expansion of the British Empire. 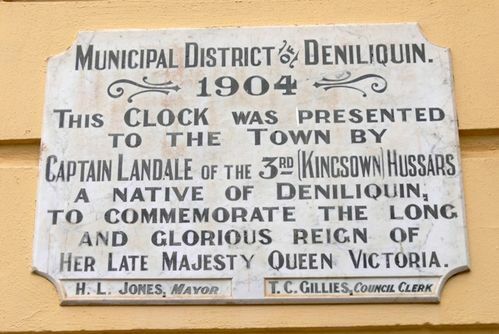 A Deniliquin correspondent writes to say that the town clock presented to tbe council was handed over in the presence of a large number of citizens this week. The Mayor (Alderman Jones) on behalf of the residents, accepted the present from Captain Landale's father, Mr. A. Landale, of Wandook. Mrs Landale and her daughters entertained the gathering at afternoon tea. Her Late Majesty Queen Victoria.